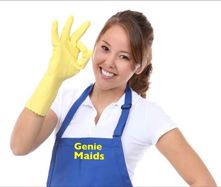 The number one reason people hire Genie Maids is to reclaim the time they are losing by cleaning their own home. How many Saturday mornings have you spent scrubbing showers, mopping floors, changing sheets and folding laundry? Our customers are spending that time with their family, reading a book, catching up on a hobby, or maybe just sleeping in. Keep in mind our typical customer is not rich. Having your home professionally cleaned can be very affordable. The majority of our clients fall in to 2 categories. The first are those that have reached a certain age where cleaning on their own has become more than they can physically handle. They may have the time, but they don't have the physical power. The second category are those who may have the power, but not the time. Many of us feel like our time is stretched thin, and having someone else do the cleaning can alleviate this. If you're on a budget, figure out what amount you can afford to have your home cleaned. What is the dollar amount your willing to budget to free up your "Saturday morning"? Once you've answered that question, call us and we'll see how far we can stretch that dollar. A short story... we have a customer who, like many of us, has experienced a dip in their earnings over the past few years. A voice-mail was left by the husband stating that they couldn't afford the cleaning service anymore and they would need to hold off for a while. In the background his wife said "you cancel the cleaners and I'm canceling your sports channels". His next sentence was "Sorry for the misunderstanding, we'll see you Thursday". So although this story is kind of funny, it always reminds me that our company provides a service that really improves the quality of life for our customers, and they adjust their budgets to accommodate us. For many, our service is not a luxury; it's a necessity. We take this to heart and do our best to please. With that, browse our site and feel free to contact us with any questions you might have. Thanks for stopping by! 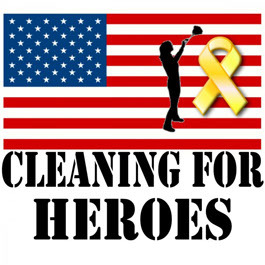 We are proud partners of Cleaning for a Reason & Cleaning for Heroes. 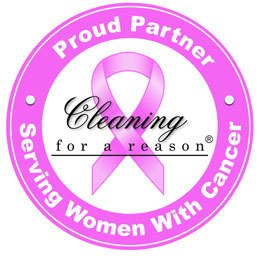 One of our goals is to reduce stress, which is why we wanted to partner with these two non-profit organizations where we provide free cleanings to women fighting cancer and to our retired / injured members of Armed Forces, Police and Fire Departments. These people could most certainly benefit from a bit of stress relief. We want to give you more time, give you a sparkling home to walk in to after our visit, and allow you to scratch "cleaning" off of your to-do list. 2003-2014 Genie Maids LLC. All rights reserved.